I've been running EMBY for a while on my ReadyNAS 516. But I tried installing the newest update from 3.6 something to the 4.0 something and it failed to install. Not only that but now EMBY is gone from showing up on my NAS. I tried going back to the version that was working, but it just all fails to install. In fact, I just finished installing an updated version of PLEX just now with zero issues. 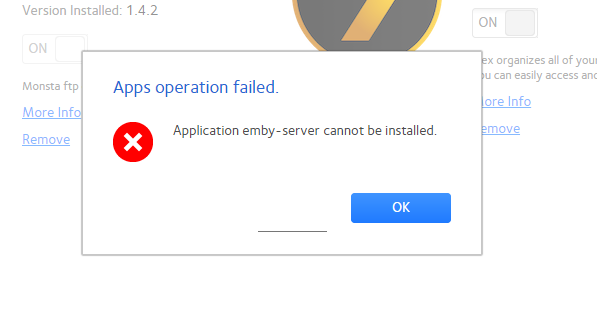 I keep getting the error "Cannot install application emby-server"
Hi there, how are you trying to install? Well I'm trying to install the deb file through the normal readynas Interface. I just tried manually and that has also failed. This is what it's telling me. Selecting previously unselected package emby-server. Edited by JBDragon, 09 February 2019 - 01:26 AM. Now comes the trouble - I've seen two other users do this before. One was able to install the correct version and they were fine after that. For the other it was not so easy. I don't recall the specifics, but it's somewhere here in the netgear section of the community. So I tried once again using the netgear version and this is once again a failed result. Why not just try using the netgear app store? I've tried that and it's failed! Every option I've tried has failed. That failed. Downloading the file and going into my ReadyNAS and using the upload file feature which is what I normally do has failed. Trying to SSH the file that way has failed. I don't know what's going on at this point. it had been working just fine for quite some time. I try to update to the latest and it failed. Try to go back to the version I was running and that fails. Nothing I try works. I'm almost at the point of trying to just delete anything EMBY and start over again, but I don't know if that'll work. I really don't want to go back to starting all over from scratch once again. This might be due to installing the non-netgear package. This sounds similar to what happened with the other person who did this. I was trying everything before that Non Netgear Package. So that wasn't it. I did just get it working once again. I use a program called WinSCP which is just easier for me to get around on my NAS, and I pretty much wiped EMBY from existence. Then I went back to the normal way of installing an app once again and this time it worked. Then I tried to update and that worked just fine. BUT I've lost everything and have to start over once again which is annoying. Thanks for the feedback. Apologies for the disruption. At least I can have everything set back up pretty quickly. Especially when there are no other users to deal with. As setup goes, it is pretty simple. I already know how to set it up and what I want and so that is a breeze for me. I have 4.1.0.7 beta running and going to try to install the newer beta version 4.1.0.8. and see what happens. Normally all goes just fine. Thanks. Trying to install this on a 4200 running latest version tried both the regular and beta but the rn refuse to install it. Hi, what is the full model number? thanks. Edited by dannieboiz, 02 March 2019 - 02:19 PM. I'm trying to find specs for that model, does it have a 64-bit CPU? That's what our package currently supports right now. I have a Xeon X3450. That's in the Netgear Nas? Does Emby Server show up for installation in the Netgear app store?